Enjoy the benefits of a performance replacement roof from Ultraframe. Let in the light and enjoy a thermally efficient design, while enjoying stunning views of the outside. Find out more by calling us today. Our Performance Glass Conservatory Roof meets exceptional levels of quality. It will add style, space and value to your home in Kenilworth, Leamington Spa and Warwickshire. Our replacement glass conservatory roof – which is manufactured by Ultraframe and uses its Classic roof as the basis for its design – is compatible with conservatories, orangeries and house extensions. It also works with almost all popular building shapes, like lean-tos and Victorian. Only the very best components are used in the design of this exceptional glass conservatory roof that excels across all of the important criteria – thermal performance, aesthetics, security and light transmission. You’ll be investing in a product that adds genuine value. Customise your new replacement glass conservatory roof by choosing a size that best suits your needs (24mm-35mm options are available). You can also select your preferred colour, so that your new room matches the themes and schemes used in your Kenilworth home. You are probably looking for a replacement glass conservatory roof because yours is no longer efficient. The Classic roof uses glazing that blocks out most solar rays, resulting in a room that is both bright and habitable 24/7. Enjoy a room for all seasons when you choose Fox Windows as your conservatory installer. Your replacement glass conservatory roof can be built to include bi-fold doors. If you want to open up your new house extension, orangery or conservatory to the outside, you’ll be able to achieve this your design aims in full. Bi-fold doors open to almost threshold length and provide fantastic views and plenty of ventilation. A decorative cornice will improve the external sightlines of your new room. We can supply them in a range of formats to suit your design needs and tastes. A flat cornice is ideal for small and large buildings. Alternatively, a curved decorative cornice adds a traditional design touch and works with any Ultraframe roof. Further improve the impact of your new glass conservatory roof by adding super-insulated columns into your design. These stunning features come in a flat or fluted design and can even sit on top of a dwarf wall. They offer thermal performance levels several times higher than brick columns built to the same scale. Your new glass conservatory roof won’t fail in response to severe weather. Ultraframe uses NASA satellite data to anticipate snow and wind loading in your area - so your newly-installed system will be able to stand gusts of up to 130 mph. Enjoy a replacement glass conservatory roof that is a genuine investment. Enjoy a room that feels like a natural extension of your home when you ask Fox Windows to install your new replacement glass conservatory roof. Your internal pelmet will be infilled with mineral wool insulation to keep you warm. It will also allow for the inclusion of spotlights to further enhance that all-important ‘real room’ feel. The Classic roof can be decorated in a range of ways. Choose from one of many eye-catching bespoke colours – foiled or in aluminium. Add columns and a cornice and add that all-important finishing touch with some elegant finishings and crestings. Use our virtual reality tour to take a look at your new glass replacement conservatory roof. Do you want to enhance the authentic room like feel of your new conservatory, house extension or orangery? We can add a central lighting panel that will act as a strong focal point and also work with the lighting in your insulated perimeter pelmet to deliver an interior that’ll be comfortable during the evening. Our replacement glass conservatory roof is suitable for a range of different design scenarios. 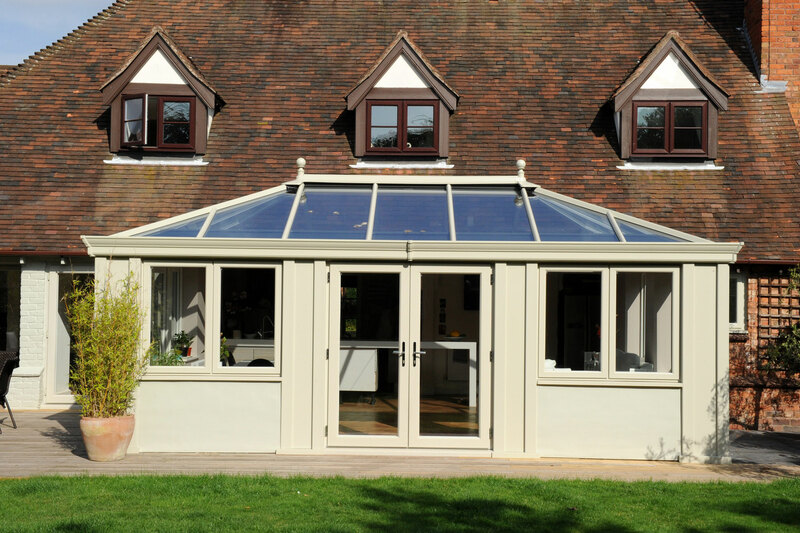 It can be used with almost any of the popular conservatory building styles – such as Gable, Victorian and T-shape. So you should be able to find what you need when you settle on Ultraframe’s Classic roof as your system of choice. Fox Windows meets the criteria needed to be awarded Ultra Installer status – a scheme run by Ultraframe to assess the quality of its members. This scheme also meets the requirements needed to be awarded Which? Trusted Trader status. You can talk to us with peace of mind when buying your replacement glass conservatory roof. Take a virtual reality tour of a glass replacement conservatory roof or get an online quote within minutes. Contact us for information about our high-performing glass conservatory roofs that are perfect for installing into your Kenilworth, Leamington Spa or Warwickshire home. You can also build your replacement system online and get a quote within a matter of minutes by using our design tool.